Argulus as seen under a microscope. Click on the photos to enlarge them and you can see the "greenish" colored Argulus that was the reason for the death of this larger koi. The argulus can also appear to be brownish in color. 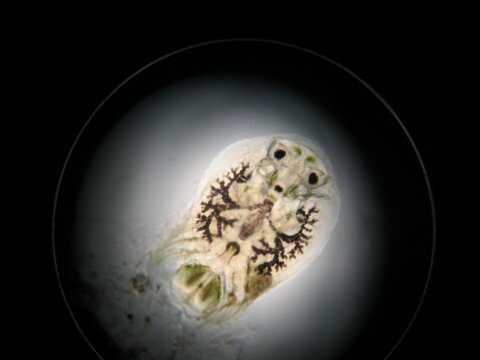 Video of Argulus (fish lice) from Bill Story. Thank you Bill for the video clip! Argulus, or fish lice, is commonly found on fish coming out of mud ponds. They can also be found in dirty ponds, ponds where there is a large build up of "mulm" on the floor of the pond. 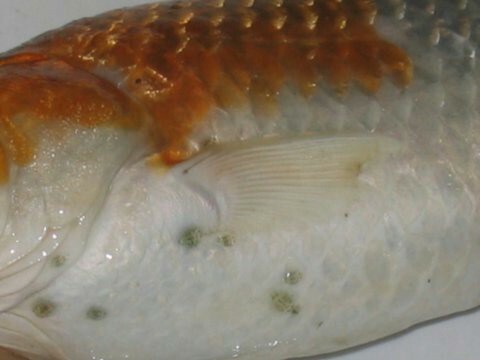 Argulus kill fish in two different ways 1) tissue damage to the fish by their "sucking" on the fish and 2) by secondary bacterial infection. Fish lice are the biggest parasite (5-10 mm) to attack fish and one of the two parasites that are visible with the naked eye. Argulus is can be readily seen on the body of a fish and it can also be found in the gills where the tissue is softer. Treatment is with dimilin or Anchors Away. Be sure to read and follow the label directions.